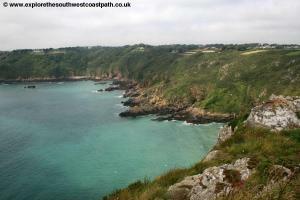 This walk follows part of the eastern and southern coast of Guernsey. 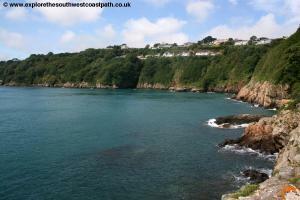 This is a rocky, rugged and spectacular stretch of coast with wonderful views, a good coast path throughout and several good sandy beaches on the way to enjoy. 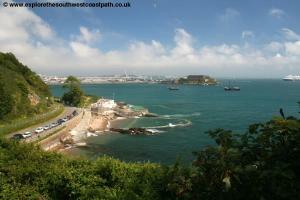 The walk begins from the Islands capital, St Peter Port. This is easily reached by road and well signed across the island. Parking however can be a problem. The island uses a disk parking system so you should have a parking disk either in a hire care or you can obtain one on arrival on the island. The majority of parking in St Peter Port uses the disk parking system and is free of charge but time-limited so you will need to find one of the longer term spaces, generally available on the harbour walls however these often fill up. Consider using the park and ride site in Footes Lane which has a bus service into the town every 15 minutes. It is also the hub of the bus network with regular bus services from most parts of the island to the bus terminas on the water front. 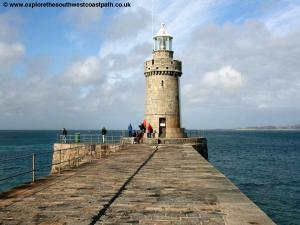 St Peter Port also has ferry services to Poole and Weymouth in the UK, to the neighbouring islands of Jersey, Herm and Sark and to Dielette on the Brittany coast. There are many hotels in St Peter Port from budget hotels up to luxury 5 star hotels, as well as some self catering properties. 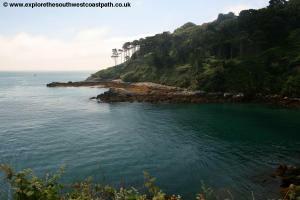 There are a couple of campsites on Guernsey which can be reached by bus from St Peter Port. 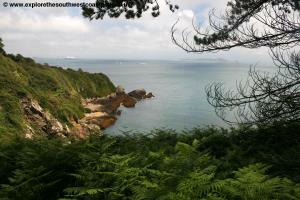 For details see Visit Guernsey - Accommodation. 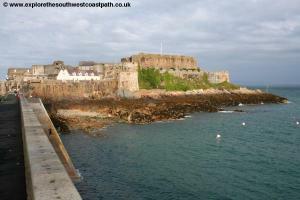 The walk begins from St Peter Port, which is the islands capital and attractive town, facing east over the water with views of Herm and Sark and the imposing Castle Cornet on what was once an island but now connected to the town via the long harbour walls. The massive harbour and marina show that the sea is very important to the economy of these islands. 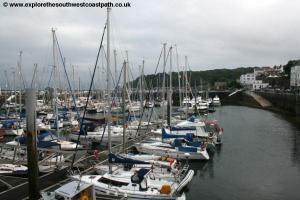 From the main harbour wall, turn right with the see on your left heading due south with the marina on your left. At the roundabout cross with care as the road leading out to Castle Corner is often quite busy. The castle is well worth a visit too and includes a number of museums within itâ€™s walls. 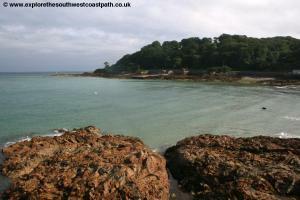 Continue south along the promenade now passing the first beach of the day, Havelet Bay. 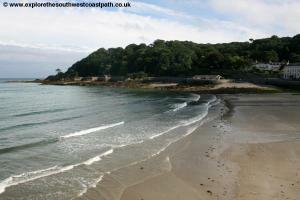 This east-facing beach is covered at high tide but at low tide is a mixture of sand and rocks backed by a sea wall and offering fine views of the castle and town. Follow the road along the back of this beach soon reaching the cafÃ© at the south side of the beach. 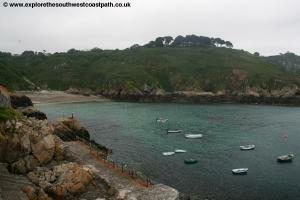 Here continue on the road passing the tidal swimming pool and soon to the end of the road, at Guernsey Aquarium. 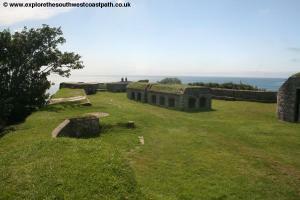 Here take the steps up to reach the castle, Clarence Battery. Here keep to the upper path (there is another dea-end path out to the end of the point) continuing on the coast path round in front of some houses. Follow the road and coast path left here along a residential road and pick up the footpath at its south end to enter woodland, offering fine views through the trees to the sea. 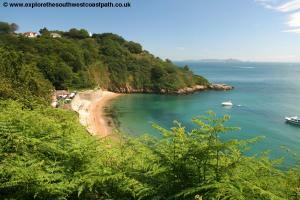 Soon this coast path brings you to Fermain Bay. This is a lovely beach of coarse sand and shingle with very clear water in a sheltered east facing location making it a popular spot. There is a Martello tower at the back of the beach. 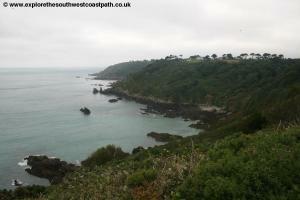 South of Fermain Bay there is a good cliff top path which soon descends down to a tiny little harbour which the path rounds to reach the small beach of Le Pied Du Mur (Marble Bay). 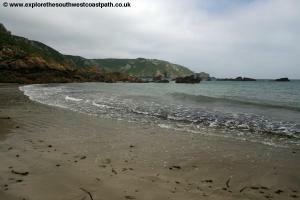 There is a small amount of sand here at low tide and the path goes around the valley at the back of the beach, climbing back up the other side to continue to Jerbourg Point. Soon you emerge from the woodland onto the heather and bracken covered cliff tops. Follow the path south and there is a soon a path on the left out to the headland, which is a dead end, but offers fine views. 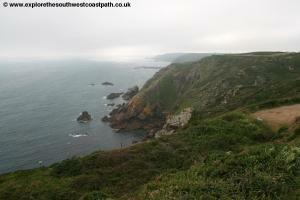 Continue south and there is another narrow path out to St Martins Point. This is a dead end and there is a small lighthouse at the end (this is not accessible to the public), which offers wonderful views. 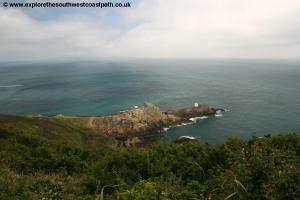 From St Martins Point head back up and follow the path ahead to the car park at Jerbourg Point. Here turn left and follow the coastal path to the left, initially a road but after passing houses soon narrowing to a footpath. 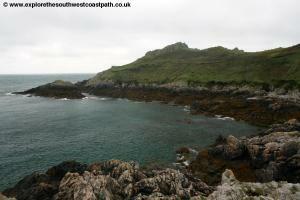 Follow this out to the end of Jerbourg Point, the south east corner of the island. 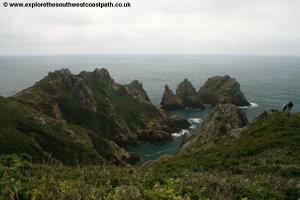 The coast is especially spectacular here with numerous rocky outcrops just off the coast, known as Pea Stacks. 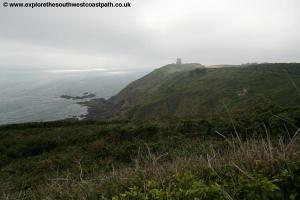 Continue on the path along the western edge of Jerbourg Point. Soon you reach the small beach at Le Petit Port. This is a good sandy beach at low tide, but at high tide the beach is mostly covered. 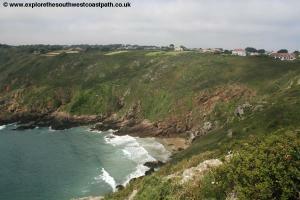 The path off to the left here leads down to the beach, but itâ€™s a long way down along the re-built steps. 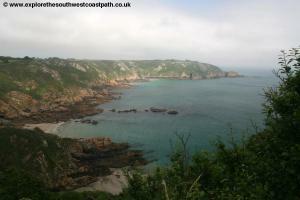 Continue on the good coast path here along the back of Moulin Heut Bay. Go round a small valley mid-way along the beach and then turn left at the junction of paths to continue on the coast path. At the western end of the beach you have to go quite a way inland around another steep valley, with some descent and ascent to briefly return to the coast and then descent into another little valley, Le Vier Port. 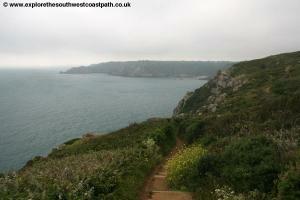 There is another path down to the beach here and the coast path continues back up on the other side of the valley. 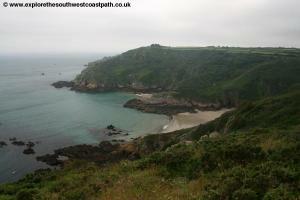 Continue on the good coastal path here to come into another valley and head down to the to the next beach, Saints Bay. 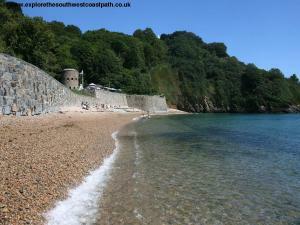 This is another sheltered bay with shingle at high tide and sand at low tide, with a marterllo tower, cafÃ© and toilets at the back of the beach as well as a small waterfall. 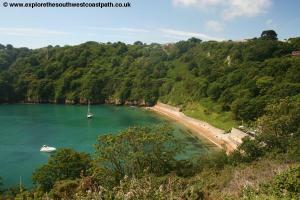 Continuing on the coast path you take the road heading along the western edge of the beach to reach the little Saints Harbour. 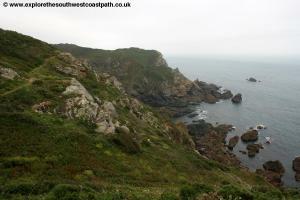 Here continue on the footpath ahead to reach the headland of Icart. Follow the path around this soon reaching a car park. Continue north here to reach the next bay, Petit Bot Bay, which has several beaches, although at high tide there isnâ€™t much beach. The path continues on the cliff top to La Bette and the next beach, Le Jaonnet. 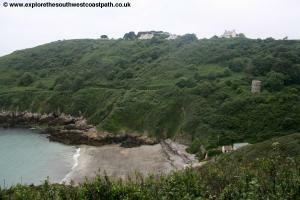 There is a steep path down to the beach here although access to the sand is only possible at lower tides. 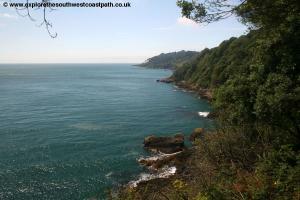 Continuing west along the coast path you take the fairly steep path into the next little valley keeping to the coast to reach Pettit Bot Bay. This is a good sandy beach, with rocks at high tide with a car park, cafÃ© and toilets as well as a Materllo tower. 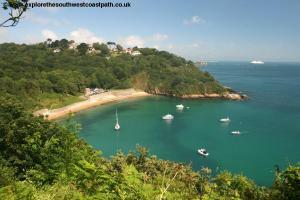 The beach is a popular due to its good sands and sheltered south facing location. 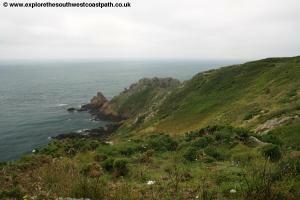 The path out of the bay is a good one, but it climbs steeply up to the next headland where youâ€™ll find St Clair Battery. 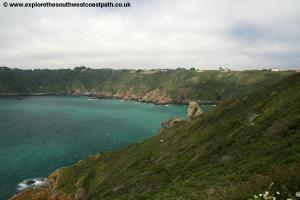 Here take the higher cliff path as the lower path to Le Portelet is a dead-end. 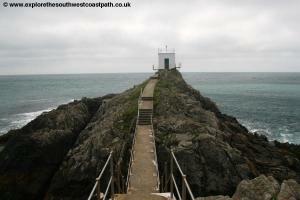 Continue pat the old watch house and as you almost join the road at the junction of tracks turn left back onto the coast path leading out to the headland at Le Gouffre. Continue on the main coast path west from here which soon comes out onto a minor road leading into the hamlet of Le Gouffre. On reaching the road procesd ahead to the cottages then turn left to re-join the cliff path. 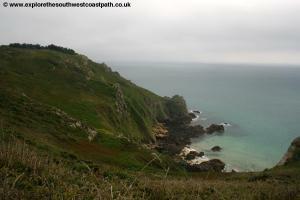 Follow the coast path west from here to reach another steep valley which you join the road above. As you join the green lane at the top of the valley turn left back onto the coastal path up to the other side of the valley. 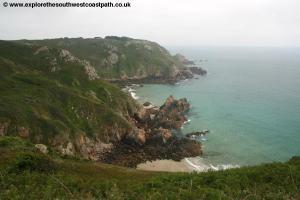 There is a little circular path out to Les Camprots or you can keep to the more main path a little inland ahead. This leads out to the road leading to a bunker, this one a rather ugly World War II concrete affair. There is a car park here too. 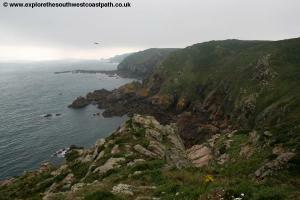 Continue west on the good cliff top soon passing the rocky beach of Havre de Bon Repos. Here youcome to another car park and tower. 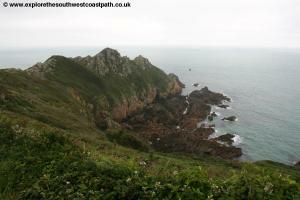 Briefly join the road from the car park and then fork left as soon as possible back onto the coast path around Clifton Valley. 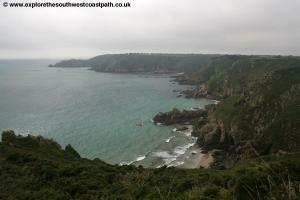 Continue on the cliff top coastal path to Les Ecriulleurs where there are another couple of valleys. 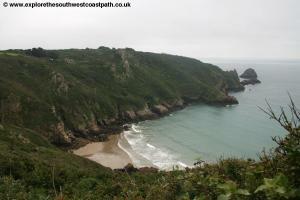 As you climb back up to the top you come to the next beach, Le Creux Mahie where the walk ends. Here follow the path inland and continue straight ahead past a single house to reach the road. Here turn left to Torteval Stores where the walk ends. 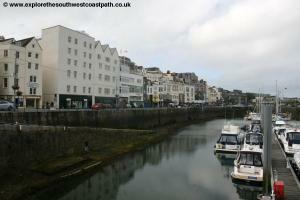 The number 7 and 7A buses will return you from here to St Peter Port. Bus services 7 and 7A run regularly from Torteval stores back to St Peter Port. However route 7A is generally quicker and runs via the airport. For details see Buses.gg. Here are some photos taken on this walk. Click for a larger version.